It’s 12 O’Clock, Do You Know What Your Child Is Eating From? My kids start back at school tomorrow and my heart is broken. I will miss them dreadfully, and hate to start all the school year routines up again. Early to bed, early to rise and homework, soccer, homework. I am exploring different options. I saw an ad in today newspaper for special fabric wraps that hold a sandwich and also function as a placemat. Cool, thought the Non-Consumer Advocate, that’s something I might actually break The Compact (buy nothing new) for. Alas, further research showed that these fabric wraps have PVC on them. Blegh! No thanks. My friend Lise was showing me what they’ll be using for their daughter this year. 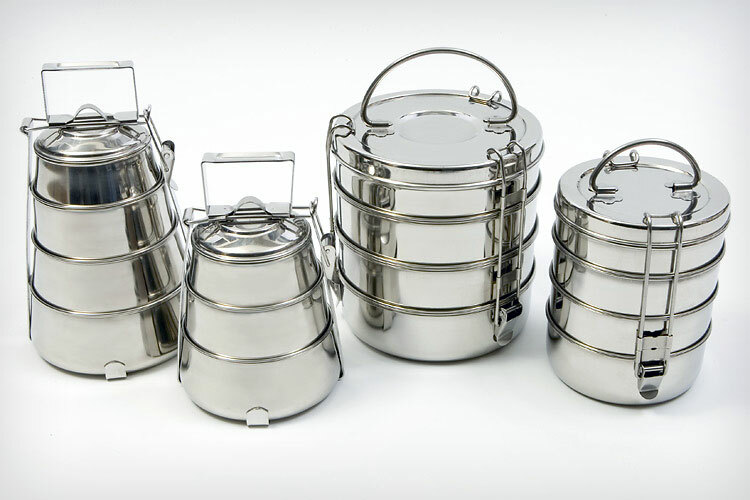 Stackable stainless steel round containers from India that has a snap on lid with handle. I’ll put that down as a definite maybe. So I don’t exactly have this all figured out for tomorrow, but I am fast-tracking this issue. I need to get the school lunch issue on a nice routine. Then maybe I’ll have time to clean the house, organize the basement, landscape the backyard and make bread from scratch. Oh who am I kidding? Then I have time to cozy up and read. Want to know more about people trying to eliminate plastics from their home? Check out fakeplasticfish.com. It just so happens I am going to review a stainless steel container not so different from the ones in the photo very soon. Maybe this week. Stay tuned. So sorry you will be sacrificing sleep-ins, and losing the company of your lovely boys. Here in Tasmania, it is 2 days until the end of term, and I can’t wait. Two weeks of going to the park, the museum, the library…and playing endless boardgames. It’s too much fun. Well done on the school lunch resolution. I stopped homeschooling a couple of years ago, and I have to say, school lunches are the hardest part of school life for me. My girls go to a school with no canteen, so I have no choice but to pack theirs every day. My son gets one school lunch per week as a treat. I do pack in plastic sandwich-sized lunchboxes, which I figure is better than using plastic wrap. My girls like to take endless little boxes of snacks and cut up food, because girls sit and chat to eat. I find that my son needs a large, uncut sandwich that he can eat and run with – there you have it, the gender politics of school lunches. I was just searching on etsy last night for some of those sandwich wraps. There are some that are just cotton, no lining. I think they would have to be washed more often but then again they don’t have the pvc. You could consider making your own. A while back when I was writing about waste-free school lunches, someone pointed me to this site. We currently have bento boxes and insulated bags, but I’ve been thinking about making those. Is there anything harmful in waxed paper? We used to have our sandwiches wrapped in that when I was little. I’ve been using tubs, waxed paper and baggies (which get washed out and re-used). But the paper is garbage (school does garbage-free lunch days) and I don’t like the disposable idea anyhow. I also would love to get away from the tubs not just because of the excessive amount of plastic — they take up too much space in the lunchbox! Keep us posted on what solutions you find, this is a topic many of us are thinking about these days. I love those dishes–they are cute, cute, cute! One thing I’ve wondered about the stainless steel products though is how one would heat things up in the microwave?